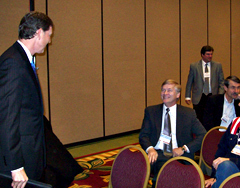 Bob Vander Plaats visits with audience after the debate. Two of the three candidates for governor clashed over the topic of party loyalty during a forum late this afternoon in Cedar Rapids. During the debate sponsored by the Iowa Broadcast News Association, each was asked whether they’d back the party’s nominee if they lose. Bob Vander Plaats, a Sioux City business consultant, suggested competitor Terry Branstad — the former governor — wasn’t always a “team player” when it came to supporting Republicans. Branstad bristled and jumped in to interrupt. “(Nelson’s) a long-time friend and I was out of office at the time,” Branstad said, charging Vander Plaats had veered away from the subject of the question. 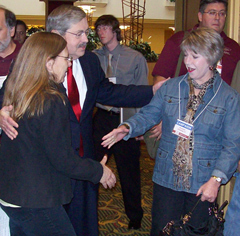 Terry Branstad and wife Chris greeting people prior to the IBNA debate. Branstad often presented his four-terms as governor as an advantage and Branstad also took a shot at the Democrat who is seeking a second term in his closing statement. “Iowans are genuinely fearful and concerned about Governor Culver’s reckless and irresponsible actions,” Branstad said. After the debate was over, Branstad loudly scolded rival Vander Plaats for a misstatement during the debate, telling Vander Plaats to “look it up” to see that he was wrong.